Citizens are enraged that his government enforced strict capital controls while he stashed his own money in the Caribbean. After Prime Minister Gunnlaugsson’s desperate maneuvers to hang on to power failed, he resigned in the early afternoon of April 5. Silla Sigurgeirsdottir, a professor of politics at the University of Iceland, is a keen analyst of the cabal of right-wing neoliberal politicians who took control of the island nation in the 1990s and then carried out deregulatory, pro-business policies. They created a financial bubble that exploded in October 2008; Iceland was one of the most acute danger spots in the worldwide crisis. Back then, Icelanders feared a collapse that could have caused another mass emigration, like the exodus during the dark economic years back in the 1870s that drained one-quarter of the population. So far, Prime Minister Gunnlaugsson himself has not been linked to this last-minute theft, although some of the other Icelanders named in the Panama Papers super-leak will probably turn out to be involved. But ordinary citizens are enraged that his government continued to enforce strict capital controls—you even had to get permission from the central bank to take funds on an overseas vacation—while he had his own money safely stashed in the Caribbean. The Icelandic banksters did not escape unscathed. 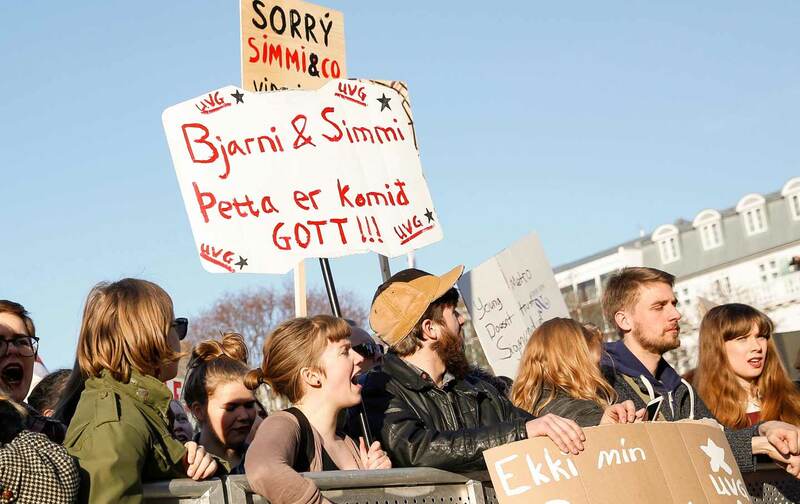 A large popular movement responded to the 2008 crisis by forcing new elections and voting into power a left coalition, which over the next four years protected Iceland from the savage austerity that was being imposed on countries like Greece, Spain, and Ireland. Unemployment in Iceland is now below 5 percent; in Spain, it is still above 20 percent. A 100-strong special prosecution team gathered evidence against the bankers, convicted more than 20 of them, and sent many to prison. The Kaupthing Bank somehow managed to lose billions; its former chairman is currently serving a four-year prison term. One of Iceland’s biggest problems after the 2008 crisis was an online bank named Icesave. The coterie of bankers and oligarchs had expanded far beyond their island nation, using paper mega-profits to buy businesses in Britain and elsewhere. To continue to fund this reckless growth, one of the banks, Landsbanki, founded Icesave, an operation that offered impossibly high interest rates to attract deposits from people in Europe. After Landsbanki collapsed, some 350,000 depositors, mostly in Britain and Holland, lost their money. The British and Dutch governments made good on the losses, but then demanded that “Iceland”—which meant Icelandic taxpayers—in turn reimburse them. Let us translate the Icesave calamity into American terms to see just how unjust this proposed solution was. Let’s say Citibank set up subsidiaries in Argentina and Brazil, and that Citibank then collapsed. Would Argentina and Brazil have the right to demand that the US government bail out the Argentine and Brazilian depositors? On what moral or legal grounds? That Citibank is “American,” and that US taxpayers—most of whom have no connection whatsoever to the bank—are therefore financially responsible for it? Why? This scenario seems preposterous, but people in the Global South have been squeezed immorally in exactly this way for the past 30 years. Even since the first modern debt crisis hit Mexico in 1982, governments in Latin America and elsewhere have repaid US and European banks with billions of dollars that in many cases those governments themselves had never borrowed. Working people in the Global South suffered through economic depressions that lasted a decade or longer to protect Western balance sheets. In Iceland, people said no in two national referendums, decisively rejecting the Icesave bailout. By contrast, the Irish Parliament pledged the staggering sum of $73 billion to rescue “Irish” banks. After four years repairing the damage in Iceland, the left coalition stumbled, and the center-right came back into power in 2013. But the Panama Papers scandal is already starting to discredit the elite once again, and if the mass demonstrations can force new elections, Iceland could be ready for another change. Iceland’s experience, including this latest scandal, should challenge some stereotypes about the causes of world inequality. There is a strong tendency in the rich world to blame a certain cultural backwardness for poverty in the Global South; people there are said to be uneducated, superstitious, and inexperienced in democracy, which leads to the rise of greedy, corrupt leaders. Iceland, by contrast, is a highly educated nation, which supposedly incarnates the Protestant virtues of rationality and honesty. The striking 240-foot spire of the Hallgrimskirkja Lutheran church is the most prominent landmark in Reykjavik, visible from 15 miles away. Iceland’s national parliament, the Althing, was founded in the year 930. But some in the Icelandic elite turned out to be not that different from their greedy criminal counterparts in Mexico or the Democratic Republic of Congo. Maybe, in the rich nations, some new intellectual humility is in order.